When cooking meats in a slow cooker, sometimes the meat ends up dry, despite there being plenty of fluid in the slow cooker. Does meat in a slow cooker eventually reach a point where it gets so tender that all of the juices just become stock instead of delicious meatiness? If so, when does this happen? Beyond a certain point, as cooking time increases, the amount of mass loss (presumably mostly fluid) will also increase, leading to drier meat. This should also cause the meat to be tougher to eat. The recipe we used is adapted from the Old-Fashioned Pot Roast recipe found in The Gourmet Slow Cooker: Volume II (page 46). We skipped the browning steps in order to limit the causes of mass loss. The downside is missing out on the delicious byproducts of the maillard reaction. Enjoy with a good hearty beer. We used Brickside Brewery‘s Park Bench Porter and Stone Ship Stout. Before any cooking was done, each chuck tender steak’s mass was recorded. The chuck tenders were arranged in the slow cooker to be easily identified later. In addition to the meat, 337.8g of raw veggies, 325.7g fluid (beef stock), 35.7g flour, and 138.0g of cooked leftover veggies were added. Photos were also taken before any cooking, and again after each chuck tender was removed. 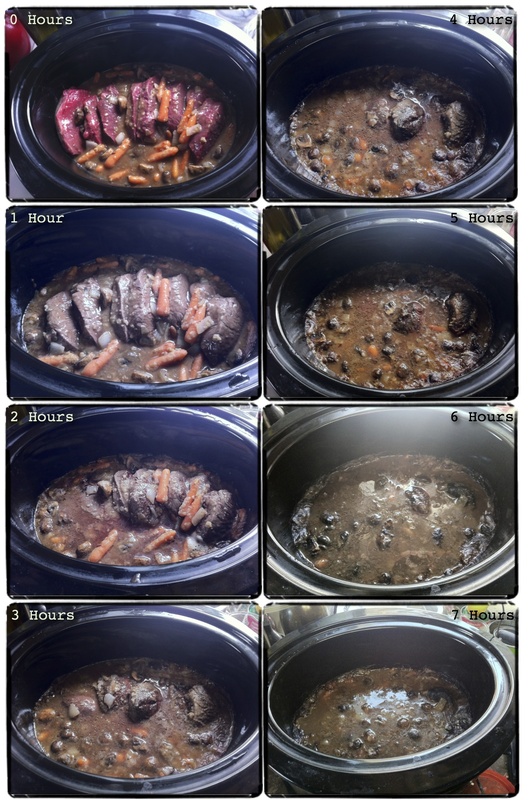 Photos showing the state of the meat after each hour of cooking. Photos for 1 hour through 7 hours were taken immediately after a chuck tender was removed. 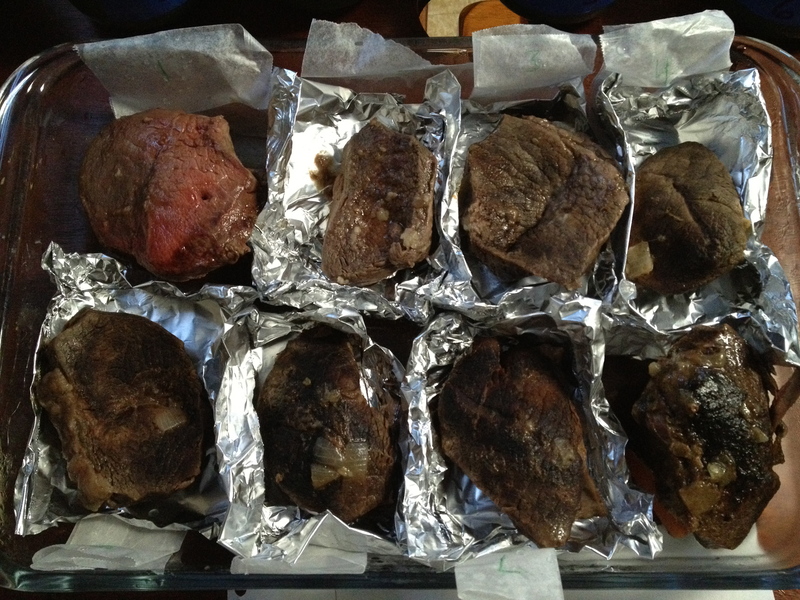 When each steak was pulled from the slow cooker it was massed again and its internal temperature was taken. Using the mass data collected, the percentage lost during cooking can be computed for each chuck tender. Below is a graph showing this loss as a function of time. As expected the loss does increase, however only for the first 4 hours, after that the loss seems steady, and actually seems to decrease slightly at 8 hours. Unfortunately there is insufficient data to determine if the fluctuations after 4 hours are statistically significant. 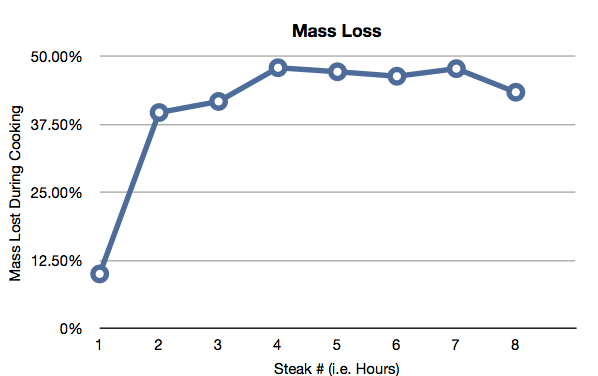 Mass lost during cooking as a percentage of the starting mass for each chuck tender. In addition to recording the meat temperature upon removal, the fluid temperature during cooking was also monitored. 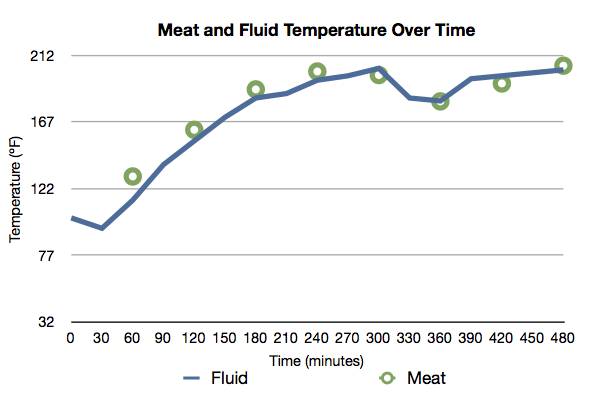 In the following graph, you can see that the temperature of the meat and fluid closely follow each other. The meat seems to lead the fluid temperature a bit, which is slightly unexpected, but not implausible as the meat was in contact with the bottom of the slow cooker, where the fluid temperature was measure near the surface. One notable peculiarity of this graph is the dip in temperature between 5 hours and 6.5 hours. The cause of this drop is not well understood and may require further science. Temperature of both the fluid and the meat throughout the experiment. Upon removal from the slow cooker, the steaks were stored in the refrigerator carefully arranged and labeled as shown below. The one hour steak is noticeably pinker than the rest, but the temperature indicates that is was medium-rare. Meat as it was stored in the refrigerator. Top row left to right: 1 hour to 4 hours. Bottom row left to right: 5 hours to 8 hours. All that is left is the taste test. But that’s another post. The rate of mass loss was rather surprising. I had been expecting a gradual rise along the entire time span, not a rather quick rise followed by a leveling off. Is this perhaps the point at which the meat ceases to be tender and starts to become dry? As cooking time increased, the percent of mass lost increased until about the 4 hour mark. Beyond that the mass loss seemed to stop. The temperature beyond 4 hours did start to fluctuate, the cause of this fluctuation is not fully understood. Assuming there is a direct correlation between mass loss and dryness, all samples after the 4 hour mark are expected to be very dry in the taste tests. The experiment was intentionally carried out using a fairly lean cut of meat and a simple fluid base. Would the results be different had we used a fattier meat such as a chuck roast. Would a different fluid such as a wine based sauce or a vinegar based sauce affect the results? Will the taste test results confirm that the meat becomes dry after 4 hours?